Ireland and Munster prop Marcus Horan has in the past cemented his place as one of the most valuable members of both squads. A mobile, pacy front-rower, Horan made his international debut against the USA in 2000, two years after breaking on to the provincial scene with Munster. He would have to wait tow years for a second run in the Ireland jersey, turning out against Fiji in November 2002 before breaking into the Ireland reckoning proper in the 2003 Six Nations. Horan cemented his position during 2003, starting eight of ten internationals before losing his place to Reggie Corrigan for crunch games against Argentina, Australia and the quarter-final loss to France. Horan continued as a squad member through the 2004 and 2005 Six Nations, deputising for Corrigan on many occasions. 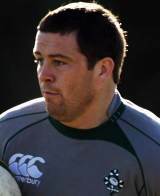 Horan toured Australia with Ireland in 2006, and took over as Ireland's first-choice loose-head following Corrigan's retirement at the end of the 2006 Six Nations. Horan was integral to Munster's 2006 Heineken Cup win, starting the final in Cardiff as his side defeated Biarritz. He then continued to star for Ireland, winning further caps during the 2007 Six Nations before winning selection for Ireland's 2007 World Cup squad. Horan started all of Ireland's games during the tournament, although he and his team-mates crashed out at the group stages after defeats to France and Argentina. After being a permanent fixture in Ireland's 2008 Six Nations, Horan started all three of Ireland's 2008 autumn internationals under new coach Declan Kidney. And he finished the season with more silverware to his name following Munster's 2008 Heineken Cup triumph. He played a key role in Ireland's 2009 Grand-Slam winning Six Nations campaign but missed outo n selection for the World Cup in 2011. In April 2013, Horan opted to call time on a career which saw him establish himself as Munster's all-time record appearance holder in the forwards.